Before I dive into the madness and exhilaration of NaNoWriMo, I wanted to leave October with a hint of what I'll be working on come December, once the NewBrightShiny Idea is written and I have some time to think through what I want to do to The Sailor's Daughters, that ridiculous piece of work that is my historical fiction novel. This picture over yonder is a photo of some of my sources--those that I have in physical form. Aren't they pretty? Yes, I am a massive nerd. Somewhere along way, these pesky Keegans went from a frothy turn-of-the-century, Jane Austen-ish story to something that requires a lot of facts and some sense of realism. All I can say is, Thank God I'm not writing about real people who existed, y'know? Pearl was a character who emerged in draft 3 when I decided to open the story in Barbados rather than on the way to England. She was so interesting even while doing nothing that instead of the nameless and faceless nanny the daughters had in drafts one and two, Pearl became the nanny. It turned out that Pearl wanted to go to England in the hopes of finding her brother, who was sold years ago to a British naval officer. Pearl is a slave; she is the lady's maid of Delphine Keegan, Miles's (late) wife. When Miles decides to leave Barbados permanently for England, Pearl, who has been freed, asks to go with the family. Pearl emerged as a strong POV as the book went on, a chance for me to explore the wider world of the times, particularly for an adult black servant brought over from the colonies. Boom--you've been freed. Boom--you're in England. Boom--how do we even find your brother? Boom--Pearl learns how to read and write. My beta recommended that I increase Pearl's presence in the next draft and I intend to, because she became one of my favorite characters the more I wrote her and her perspective on the family she serves is very unique. I finished reading a book by Andrea Stuart called Sugar in the Blood recently. In it, Stuart writes about the history of Barbados from the landing of Europeans until the present day, with particular emphasis on the sugar industry and the slave trade---things that are of particular interest to me in terms of the first part of the novel. I thought for a brief moment about cutting out the Barbadian scenes entirely, but I want to deepen them, do them better, because I think England in the late 18th century/turn of the 19th century is a well known setting, whether from costume dramas, Jane Austen, Regency novels, Georgette Heyer. But Barbados as a setting in the same period...not so much. What made Sugar in the Blood invaluable for me is that Stuart wrote the history using her own family tree. Her first maternal ancestor to set foot in Barbados was an English blacksmith named George Ashby. George received a little bit of land, an indentured servant, and tried to grow tobacco before switching to sugar, the cash crop which made the Caribbean so valuable back then. George found a wife, had some kids, bought a couple of slaves, and eventually had a descendant named Robert Cooper Ashby, who married into a wealthy family and was a planter. Robert Cooper had liaisons with many black women, resulting in many mixed kids--one of whom, John Stephen Ashby, was Andrea Stuart's ancestor. 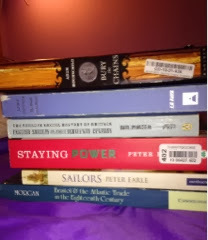 Also, the book being non-fiction, there's a big fat bibliography at the end which I am mining for some aspects and sources I still have questions on. I spent Saturday afternoon formatting my bibliography. Research Writing class from college has come full circle. It was tedious, but EasyBib.com makes all the difference. Is a bib strictly necessary for a novel? No, but I like seeing a book or two mentioned in Author's Notes in the back of novels. I wanted to at least have an organized bib so I could see how many sources I've used---and also, in case a future agent or editor asks. You never know. So far, I have 22 sources, not including a couple of documentaries I watched on YouTube, many many web searches, and other spot-check-y things. Don't know if that's considered a few or a lot of sources, but yeah, I feel pretty damn proud of myself for reading all those things and taking notes. I didn't have 22 sources for my graduate thesis, y'all. So, my bib stats: 11 of the 22 were published in the past decade. The oldest source is from 1743 (A description of the Exchange of the City of Bristol).The newest was published in 2013. Is it any wonder that my NaNo project is a fluffy, modern-day, New York-centric story? My brain needs a little vacation. But, Yes! Brain, take a vacation! Lol! Oh my gosh, that's a lot to sift through. You're so awesome for that. I could never... I had to watch a movie (a MOVIE!) for my NaNo project and it still took me 2 and half months to do it. It was The Ides of March with Ryan Gosling. It's actually really good and helped a lot with the office politics I'm going to have going on in the story. And then I have another story with political themes that I watched a much less interesting documentary for, but that was also extremely helpful. That research was even longer overdo at 4 months. I did them the same weekend because I'm a procrastinator like that. Lol! Did I say you're awesome? You're freaking awesome. Lol! I can't believe you remember that! Yeah, I see ways to have more Pearl in there. I feel like I should've really researched some of this stuff two years ago...but then I did the bib and I finally saw the publishing dates in one place and realized that a few really helpful sources weren't published in 2011, when I started the the first draft of this WIP. I created a bibliography for my historical too, and my publisher is letting me include it. It doesn't have every single source, but I think I listed most of the really significant ones. 32 books and articles. And I was writing about real people. I just wanted to get the organization part of the bib out of the way. 32 sources! Oh, my God! I can't imagine how many sources I would've gone through already if I was writing about real people.